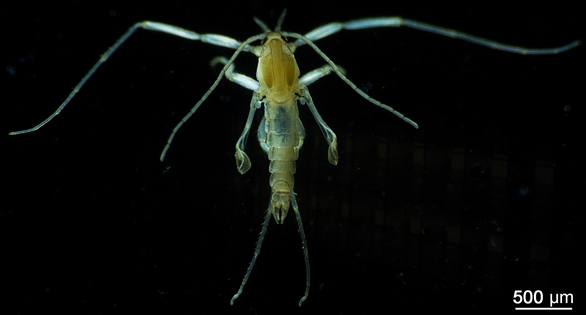 Pontomyia natans, a marine midge. Image: Danwei Huang, World Register of Marine Species (WoRMS). One of the reasons I enjoy the reef aquarium hobby is the continual chance to see something odd. The regular animals that I purchase for my systems are interesting enough, I suppose, but after a while they lack the pizzazz that comes with seeing something brand new in my tanks. For that reason, I suppose, I truly look forward to finding hitchhikers or stowaways in my tanks. Even if they are somewhat deleterious, I really don’t care, as long as they are something new. Notice that the preceding sentence excludes many of the common hitchhikers. I have seen quite enough of Aiptasia pallida, thank you very much. However, I surely wouldn’t mind seeing some totally different small anemones. I thought that over the next few months I might write a series of short blogs discussing one or another species of something weird and wonderful that has shown up sometime or other either in one of my tanks, or in somebody else’s tank and they have asked me about it. Being an invertebrate zoologist, I generally can identify these hitchhikers reasonably well, and I have other resources that I can draw on that will tell me something about anything I am likely to run across, so I am not too worried about what I may find. If it turns out to be nasty, well, I am generally much bigger than it is, and can consign it to that “Great Reef In The Sky” (otherwise known as my friendly neighborhood garbage can) without too much mental anguish. If it, on the other hand, turns out to be relatively neat, I can always get some images of it, and maybe even write a short note for this blog. One of the great peculiarities of biology is the lack of marine insects. The design of the insect body is for all intents and purposes perfect – for terrestrial and freshwater environments. There are many, a great many, tales and anecdotes about the success of insects on earth or in fresh water…and then, when we move over to the majority of the planet, the blue of the “Blue Marble,” we run out of tales, tall and otherwise, about bugs. The types of marine insects are so limited that there really is hardly a tale to be told. Every now and then, a hitchhiking insect shows up in a marine aquarium, and with careful observation, it becomes evident that the bug actually is found in the marine tank. There is always the possibility that any given insect in a reef aquarium drops in from the air over the tank. Most reported insects found in marine tanks are this sort of beast: a bug that landed in the wrong place and met its untimely end in a saline environment. However, sometimes an aquarist will make the proper observations and will take some decent images – in other words, images taken with a camera, not a smart phone – and, lo and behold, there is an image of something truly strange and wonderfully odd, to be posted somewhere on the web. A truly bona fide marine insect. The largest populations of marine insects are water striders in the genus Halobates, that may be found far from land, although some species are also common near the shores. All are predatory, but just to make things interesting and clear, I don’t know of any examples of these finding their way into aquaria. However, about a decade or so ago, there were several reports of people finding very small surface-skimming critters in their tanks. At the time, I moderated a forum on invertebrates in reef tanks, and a couple of people contacted me and offered to send me some specimens. Naturally, I accepted. Not only are these tiny insects interesting as being marine insects, they have some of the oddest life history attributes that I have ever had the chance to encounter. As I mentioned, they are tiny, no more than about three millimeters long. They also have a short life span, living only about 30 days, most of which is spent as a larva. When they were first described, they were thought to be wholly subtidal in their habitats, but it turns out that the adult males, at least, spend their life–all 180 minutes or so of it–on the water’s surface. The adult females metamorphose into adults that look like larvae, which, given that they are gnats or midges, means they look like maggots, because, let’s face it, they ARE maggots. For most of their 30-day life span, both the males and females live in an algal tube or cocoon of their own construction, and they consume algae or marine detritus. The males metamorphose into surface-skating gnats or midges. They live as adults only to breed, after which they die. When they mature into adults, the males metamorphose first, about half an hour before the females. Animals of neither gender feed as adults. The adult males live only about 2 to 3 hours. Once they hatch, the males support themselves above the water surface on the terminal segments of their first and last legs. The males move by propelling themselves using their wings as oars while they search for the immobile females, which float hanging downward from the water surface. The males hunt for females, and once they are found, the male’s middle legs are used to hold on to the female while copulation occurs. After mating, the male dies and the female produces a sinking egg strand which adheres to corals or rocks. After producing her eggs, the female dies, and the life cycle continues. That they turn up in reef tanks is decidedly odd, but it does happen. It is likely that either eggs or larvae were collected adhering to specimen corals or live rock in the Indo-Pacific, and these found their way into hobbyist tanks. These flies have only been collected a few times in the Caribbean, and those collections have been of typically Indo-Pacific species. Given their decidedly limited dispersal characteristics, it is unclear how these species–which are distributed throughout the Indo-Pacific–became dispersed at all. Recent work, however, shows that they may get spread around by larvae adhering to sea turtles, but much more work is necessary to investigate that hypothesis. Cheng, L and D. Huang. 2014. Discovery of the flightless marine midge Pontomyia (Diptera:Chironomidae) at Christmas Island, Australia. Raffles Bulletin Of Zoology, Supplement No. 30: 93–96. Huang, D. and L. Cheng. 2011. The flightless marine midge Pontomyia (Diptera: Chironomidae): ecology, distribution and molecular phylogeny. Zoological Journal of the Linnean Society 162:443-456. Schärer, M. T., and Epler, J. H. (2007). Long-range dispersal possibilities via sea turtle – a case for Clunio and Pontomyia (Diptera: Chironomidae) in Puerto Rico. Entomological News 118, 273–277. Soong, K., G-F Chen and J-R Cao. 1999. 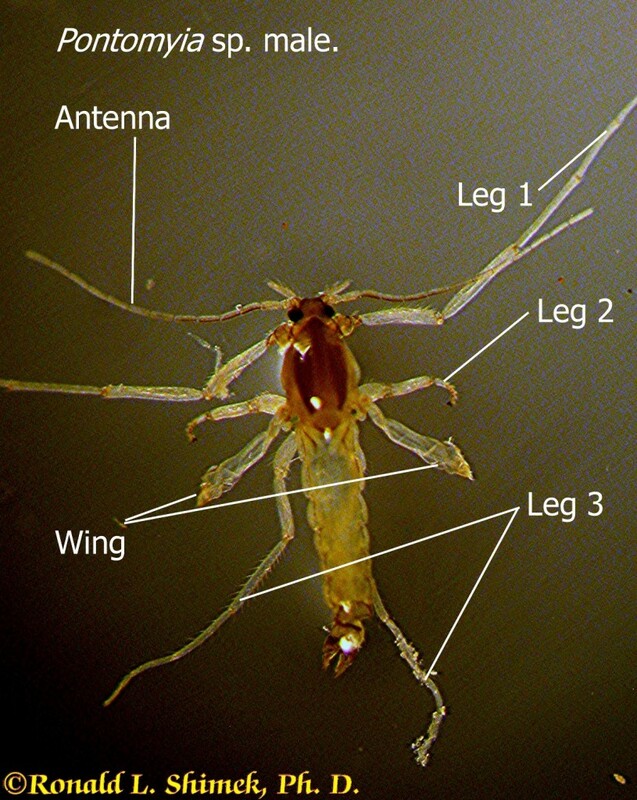 Life History Studies of the Flightless Marine Midges Pontomyia spp. (Diptera: Chironomidae). Zoological Studies 38: 466-473. Image (Top): World Register of Marine Species (WoRMS).